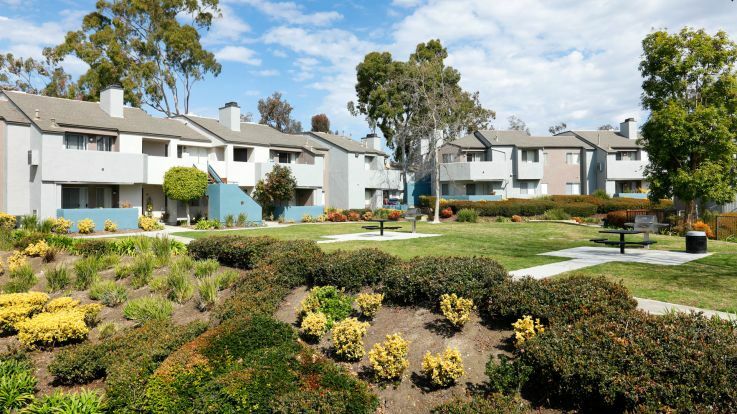 Laguna Hills apartments are located in a comfortable suburban community just 10 miles from the ocean. Our luxury apartments are perfect for employees of local companies, especially at the Irvine Research Center and surrounding business parks. Residents of our Laguna Hills apartments are close to both the I-5 San Diego Freeway and CA-73 San Joaquin Hills Transportation Corridor for easy driving to the rest of Orange County. Public transportation is also an option, with bus stops practically at your doorstep. Our apartments are also close to shopping, schools and recreational facilities. Equity's Laguna Hills apartments are convenient for students of Saddleback College, University of California Irvine and Soka University of America. Parents can send their children to respected schools run by the Saddleback Valley Unified School District. These include La Paz and Los Alisos Intermediate Schools and Laquna Hills High. Families can relax at nearby Sheep Hills Park. There are also athletic programs and classes offered down the street at the Laguna Hills Community Center. For golfers, there are several area courses, including Mission Viejo Golf Course and Tijeras Creek Golf Club. All of this is just minutes from our Laguna Hills apartments. Grocery and big box stores can be found nearby at Alicia Valencia Plaza, Western Country Plaza and the Laguna Hills Mall. You will also find many quaint stores and coffee shops in the community surrounding our Laguna Hills apartments. Restaurants run the gamut. You can dine on Indian food, Italian-American cuisine, steak, seafood or, if you don't have time, fast food. And being in Orange County you are close to attractions like Disneyland, Knott's Berry Farm and the Orange County Great Park. Equity's Laguna Hills apartments have uniquely designed interiors that feature fireplaces, vaulted ceilings, linen closets, dining areas and private balconies or patios. Apartments include washer/dryer or washer/dryer hook-ups and are internet and cable ready. The beautiful kitchens have modern appliances including microwave ovens and dishwashers. Residents of our Laguna Hills apartments enjoy amenities like a swimming pool, picnic areas, fitness center and trails for biking, walking and jogging. There is even reserved covered parking and a courtesy officer. Laguna Beach apartments are a terrific place to call home. However, if they do not meet your individual needs please consider Equity's other luxury properties in Mission Viejo and Rancho Santa Margarita.